We drink a lot of milk at our house. We go through about four gallons a week. Caleb and Maxwell are little milk chuggers. The other day we were at the store and Caleb spotted the eggnog. He told Maxwell it is Santa’s special milk because stores only have it at Christmas time. The boys begged to get some so I picked up a half gallon. 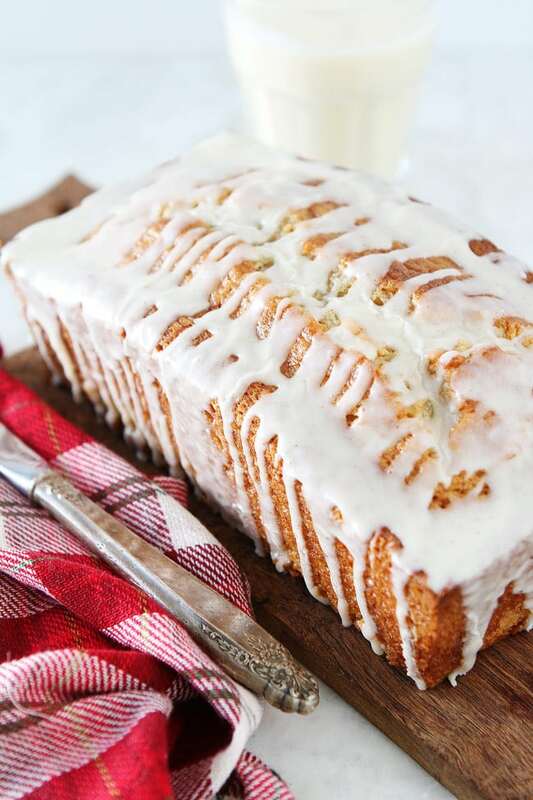 When we got home, I poured them a little glass and decided I would do some baking with “Santa’s special milk.” I made a loaf of Eggnog Bread with a sweet eggnog glaze and I think Santa would approve. 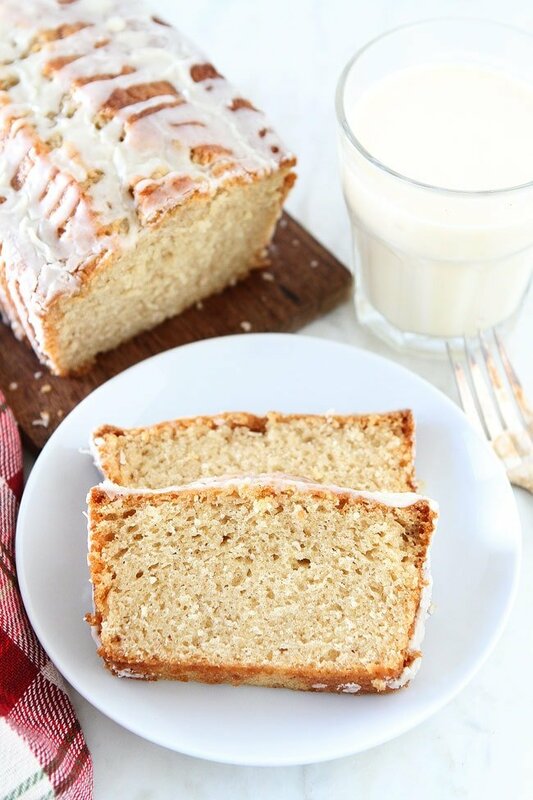 This easy Eggnog Bread is the perfect holiday treat. To be honest, I am not really a big eggnog person. I love the flavor, but I don’t like to drink it. That is why eggnog baked goods are perfect for me. I get all of the delicious flavor in a special baked treat! There is eggnog in the bread which gives the bread tons of flavor and it also keeps it super moist. I also add in nutmeg, vanilla, and rum extract. Because it’s the holidays, I added a sweet eggnog glaze. The glaze makes the bread extra beautiful and extra festive! We go all out during the holiday months. 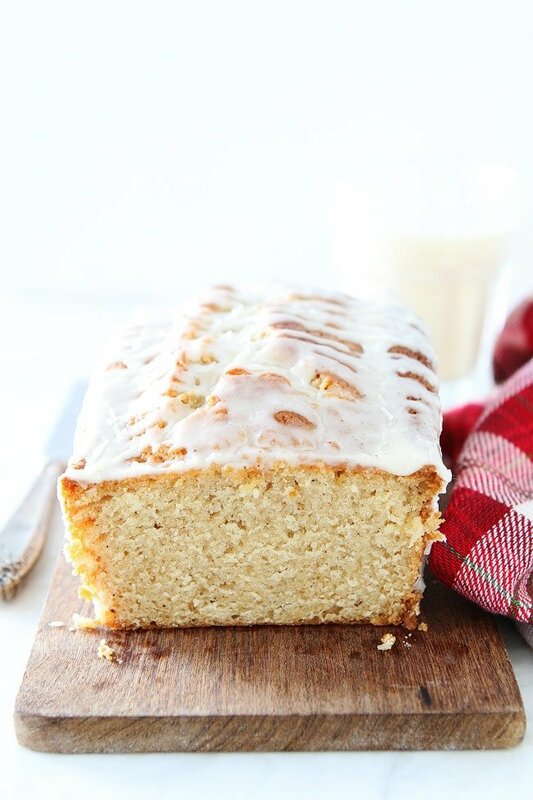 This easy eggnog quick bread is great for breakfast, snack time, or dessert. And guess what? I think the bread is even better on the second day so you can make it in advance. It is great to have around to serve to friends that might stop by or guests that are staying with you. 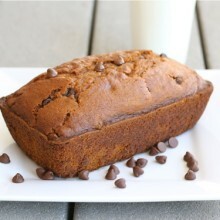 It would also make a great gift, mini eggnog loaves would be so adorable! 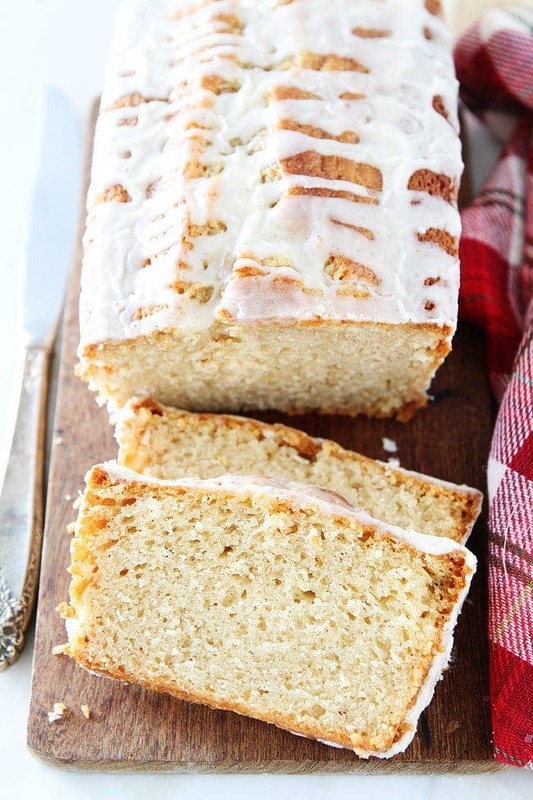 Celebrate the holiday season with Eggnog Bread. The boys enjoyed a slice of bread with a glass of cold eggnog and they said they wish Santa sold his milk at the stores all year long..ha! They loved it! 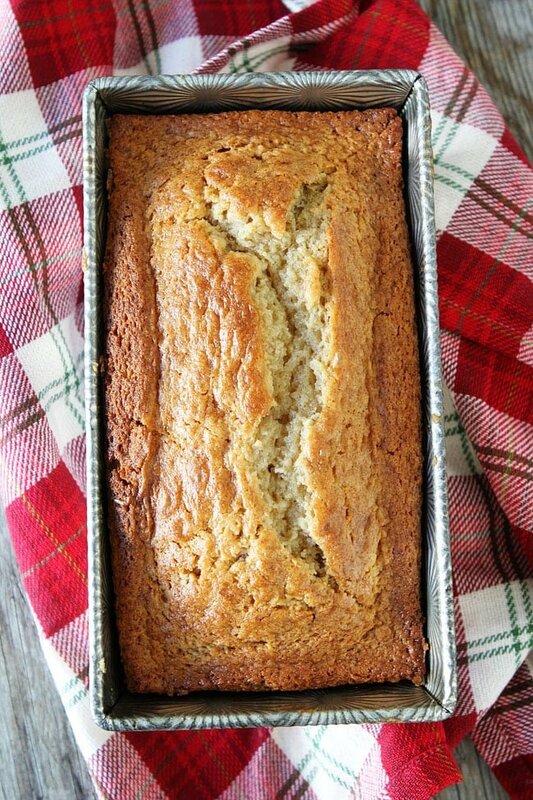 This easy eggnog bread is a holiday favorite. Serve it for breakfast, snack time, or dessert. It also makes a great holiday gift! 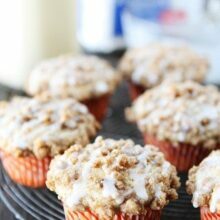 In a large bowl, whisk together the flour, sugar, salt, baking powder, cinnamon, and nutmeg. In a separate medium bowl, combine the eggnog, oil, eggs, vanilla extract, and rum extract. Slowly add the wet ingredients to the dry ingredients. Stir until combined. Pour batter into prepared loaf pan. Pound on the counter so the loaf cake is evenly set in the pan. Bake for 65-70 minutes, or until toothpick comes out clean. Place the loaf on a cooling rack and cool for 15 minutes. Loosen the sides of the bread with a knife. Carefully remove loaf from pan. Let cool completely on wire rack. While the bread is cooling, make the eggnog glaze. In a small bowl, whisk together powdered sugar, eggnog, vanilla extract, rum extract, and nutmeg. Drizzle the glaze of the cooled loaf cake. Cut into slices and serve. Note-if the cake isn't done and the top is browning too much, drape a piece of aluminum foil over the top and finish baking until a toothpick comes out clean. Oh my, but this sounds wonderful! Darnit, I was hoping this recipe would create the eggnog flavor for us American expats living where commercial eggnog is unavailable. Now this is my kind of bread! YUM! Your boys are so cute, love “Santa’s special milk” story and love this recipe! I am with you on the egg nog thing! But it sure looks like it makes a perfect bread! With this being a bread, I should be able to make this and then use the bread for French toast yes?? That is a great idea! I need to try that next time! Looks delicious!! My son would love this! Do you think it would work ok making it with a gluten-free flour blend and dairy-free eggnog? I haven’t tried it with gf flour or dairy free eggnog, but let me know if you try it! It might be a little different, but should still work. 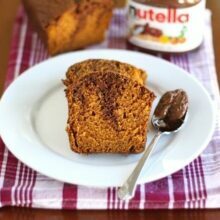 I just made this using Bobs Red Mill gf flour added some xantham and also used SO Delicious brand coconutmilk nog and substituted coconut oil for the other. It turned out wonderful. My son who doesn’t like the taste of nog, had a small piece and said he liked it! My daughter gave it 10 stars! Super easy to put together and makes the kitchen smell oh so good. Yay!! Glad it worked out! Thanks for the update Heather! I’m going to give it a whirl for my Egg Nog loving GF/Dairy free little guy!!! Heidi, not Heather – Sorry!! Definitely trying this recipe! Although I *do* like to drink eggnog (we recently “invented” Firenog by using Fireball cinnamon whiskey as the “spiking” element, yum! ), this looks easy and dellish. I love your story of eggnog being Santa’s special milk. Think we’ll start calling it that at our house, too. Hope you and your family have a wonderful Christmas! I am constantly making eggnog bread and eggnog pound cake and eggnog cookies this time of year. It is something my family loves loves. If I don’t have rum extract on hand – would almond extract be a good substitute? If you don’t have rum extract, you can use rum or just leave it out and add a little more vanilla. If I do not have rum extract, you said to add more vanilla – would it be the same measurement as the rum extract? This bread looks amazing! I’m totally going to make it tonight for our neighbors! could you make this in little bread loaves for holiday gifts? Also does it freeze well? Love all the recipes I have tried so far. Yes, you can make little loaves just adjust the baking time. The little loaves won’t take as long. Yes, the bread freezes well. Enjoy! Ohh! 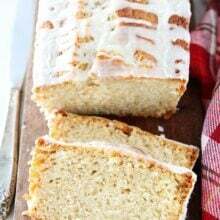 Eggnog bread! Perfect for Christmas Morning! Hi there! How should this be stored? Thanks! I store it on the counter, covered with plastic wrap. Enjoy! I certainly should not view your delicious recipes before breakfast!! Thanks for the recipe and keep those great recipes coming. Ugh…my canola oil has gone bad, and I’d like to make this today to take to a party tonight…can i substitute butter and if so, how much? MANY MANY THANKS! I haven’t tried it with butter. Do you have vegetable oil or coconut oil? If you have to use butter, use the same amount and let me know how it goes! This is in the oven right now…my hubby and I are drooling. It smells absolutely amazing!!! Thank you so much for all of your awesome recipes! My family absolutely loved this! It came out pretty dark so next time I’d cover it in foil at the end and maybe bake 5 less mins. I’m going to make it again for a Christmas eve brunch this week. Thanks for the great recipe! I’ve made a double batch of this TWICE in the last week! The second time, I added a couple handfuls of fresh cranberries and loved this version. I’ve used 50% whole wheat flour and it’s still delicious and moist. Thanks for a great recipe! This was so easy to make and tastes great. Would I be able to make this in a bunt pan? Great recipe. I didn’t add the icing but it was great without it! It is very moist and not overwhelming eggnog favor. I used rum instead of rum extract. I’ve probably made this recipe easily a dozen times over last Christmas in this one. It tastes absolutely amazing every time but for some reason about two out of every three times I make it it doesn’t rise properly. I feel like I’m doing the exact same thing every time but obviously I’m not. LOL. Could you maybe offer me some insight as to what I would be doing wrong? Great recipe and so easy. Made this many time over the holidays and gave as gifts. Everyone loved it. So moist. Since I like cinnamon and nutmeg I did add more. I also doubled the recipe since I was giving them as gifts to so many friends. Totally amazing!! I wish I had more eggnog to make more! I will definitely have to learn how to make my own eggnog just so I can make more of this bread!!!!! The only change I will make the next time will be to spray and flour my pans to keep the loaves from sticking. Thank you for sharing this fabulous recipe!